I made an editor for the Genesis version of NHL '94. It's called "EARE" -- "EA Rom Editor." The name is a play on wboy's "NOSE" (NHL Old-School Editor) editor for the game. This isn't meant to replace NOSE; it's to do things that NOSE doesn't do. At v1.0.0, EARE does everything I initially planned for it to do! Change the Offense/Defense/PP/PK/Home/Away strengths of the teams. Change the number of teams selectable in the main window. Set the player pictures if you have switched the teams players are on. This works easily if your ROM uses the original players but on different teams. If you have custom players, see the Help.txt file to get an understanding of how you can make it work with custom players. If you change values in a window but don't hit Apply, you aren't warned to save your changes if you close the ROM or EARE. - ROM Name now editable. This is the ROM name that appears in the title bar of the emulator. - Game's checksum routine is removed when you save. - Doing Save As without first modifying the ROM produced an empty file. - Recent Files list did not update after reaching a length of 5 files. - An opened ROM was closed if you cancelled before opening another ROM. - Team Ratings - Now viewable and editable in the Teams window. - Now remembers the last directory you opened a file from and uses it the next time you use File->Open or File->Save As. - The "Set Player Pictures" window now starts minimized to avoid accidental usage of the feature. - If you use the File->Close menu option, EARE now clears the file name from the main window title bar. - Fixed the bug that caused EARE to crash if a ROM contained any team lines with any number of empty player slots. EARE will show a warning message if it notices this problem. You should fix the problem in NOSE by making sure all lines on all teams have all 7 players specified (G, LD, RD, LW, C, RW, and Extra Attacker). - Fixed the bug where goalies without personalized pictures were given generic player pictures instead of generic goalie pictures. 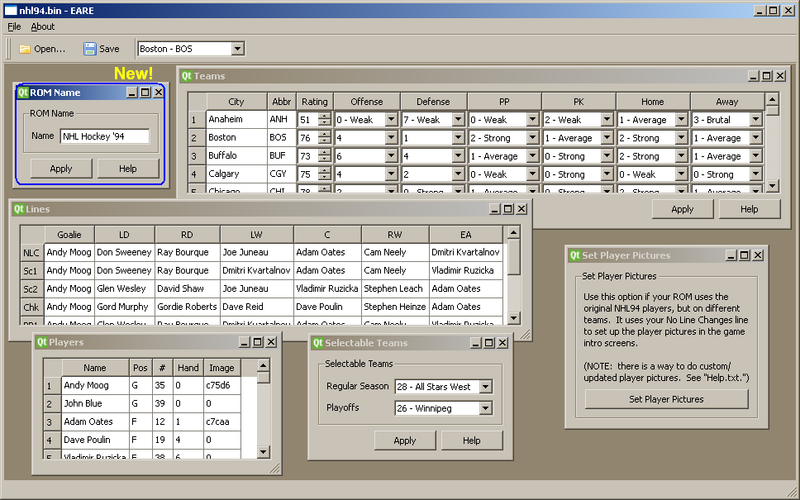 - New "Set Player Pictures" window that automatically sets the player pictures for all teams. If your ROM uses the original NHL94 players (Roenick, etc) but on different teams, then just hit the button and it does it. If your ROM has new/custom players and pictures, see the EARE "Help.txt" file for information on how to make this feature know how to use your players and pictures. - New team selector dropdown box on the toolbar (like in NOSE). - New "Players" window displays the players on each team. - The Players window also reads the file "PlayerCardsDefault.txt" which lists the names and hex address of the pictures of each player. The window can then display the picture address for the players with pictures. Players without pictures have a value of "0". NOTE: If two players have the same name, EARE can not tell them apart, so will give them both the same picture (for example, Stephane Richer). - New "Lines" window displays the lines for each team. 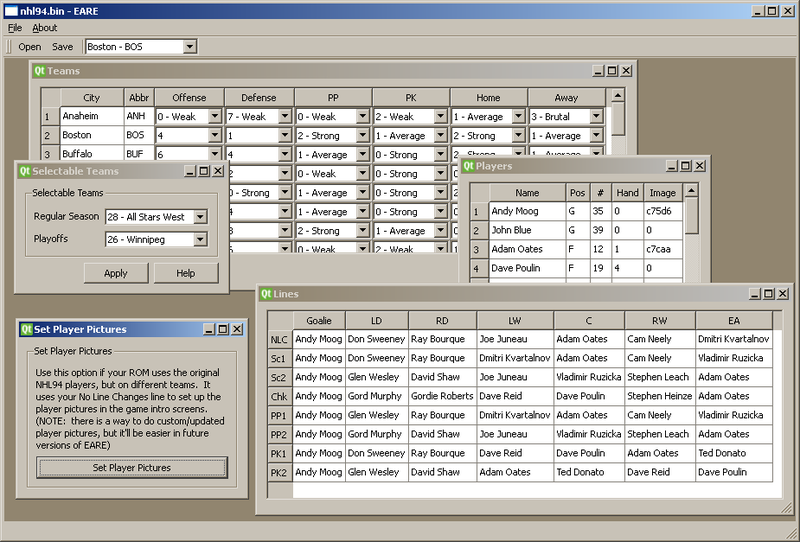 - New "Teams" window allows you to change the offense/defense/pp/pk/home/away	strengths of the teams. 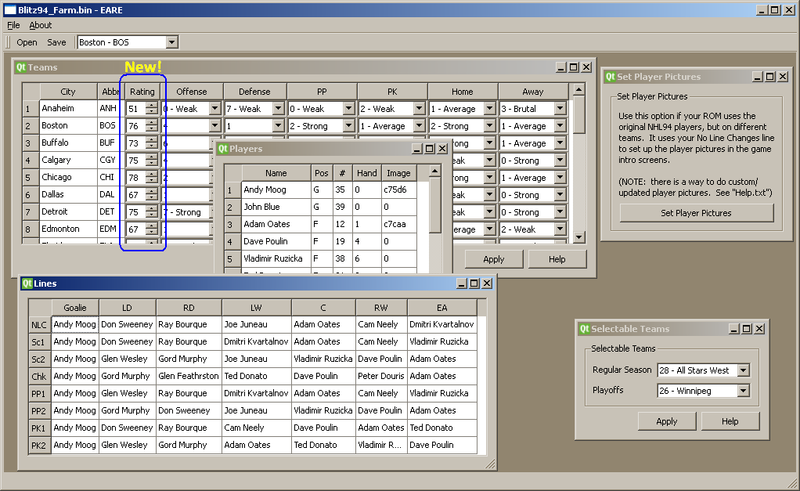 - "Selectable Teams" window dropdowns now list the team names along with the team numbers. - Now properly sets the away team selection limit. Thanks to Vocally Caged for noticing and reporting this bug. - Got rid of mingwm10.dll dependency that caused it to not work on most computers. This had the pleasant side effect of reducing the file size by about 25%. Thanks to TubaHero and Vocally Caged for reporting this issue (and there might have been a 3rd person, I forgot!). - Can set the number of teams that are allowed to be selected in the main screen for both Regular Season games and Playoff games. This allows you to hide teams you don't want to see in your custom ROM. I also considered the name NEZ for NHL94 Editor Z, but it looks like it would be related to the NES, so I went with EARE! CHINN - CHinn Is Not Nose. For those who were getting the "mingwm10.dll" error, that should be fixed now in v0.0.2. See first post above. Not sure if it's just me...but everytime I edit a rom for less teams and save it it doesn't load in any emulators? Says it loads but the thing stays black instead of giving me an EA Sports screen. Anyway, to 'fix' your ROM, just open it in NOSE and save it. It will delete the code in NHL94 that causes this behaviour. That worked! Haha I found something else though. It limits Team 1 to eight teams...but Team 2 still has all 30 available? Is that regular season, or playoffs mode? I know with playoffs mode, you also need to go into NOSE and change the playoff matchups to eliminate the teams you don't want to see (I think the fewest teams you can do without causing a crash is 16, too). for noticing and reporting this bug. 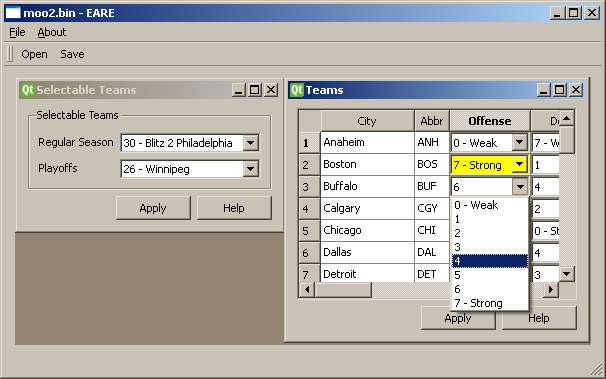 - New "Teams" window allows you to change the offense/defense/pp/pk/home/away strengths of the teams. 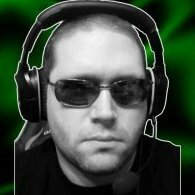 This one could be used on the GDL ROM to set up the player pictures in a couple seconds! Awesome stuff! Haha you know how bad I am at playing with those freaking things in a hex editor. here is my million dollar question. I've already built a super nhl 94 rom through nose for my own personal use, is it possible to use EARE to rest the pictures and do further editing while still maintaining the user records and other such goodies on the rom i built through nose? user records are stored in a separate file by the emulator, [rom name].srm, i think. as long as your new ROM has the same file name, it should still get the user records from that file. Can you try it out and report the result? So it can do custom player pics or it will in the future? Sorry It's Friday and I'm tired. There's a Help.txt file in the EARE zip file that explains how to do it. You have to put the graphics in the game yourself with Tile Molester, and then create a text file that maps the player names to picture offsets in the ROM (example: "Jeremy Roenick,0013B1D6"). Then you just load the ROM in EARE and hit the "Set Player Pictures" button and it uses the text file to set up the ROM so the right pictures are displayed. It sets them to match the "No Line Changes" line. The test was a success! Thank you good sir. Once again I'd like to say thanks for this. It does really help with GDL and I can't wait for your further dumbing-down of card editing. Wait...I just now figured it out. First NOSE, then EARE...is the next one going to be THROAT? I'm thinking it's gonna be The Hexadecimal Rearranging Of AI Throughout. Favorite Way To Score:Whatever way lights the lamp. probably doesn't work with 93, and I don't see myself adding support for that, sorry.